Route 160 heads west across the sprawling San Luis Valley, before dipping south at Alpine, Colorado, where it begins a steady climb to Wolf Creek Pass and the Continental Divide. At 10,857 feet, the high mountain pass is a marvel of engineering. Once a narrow two lane road, it has been transformed into four lanes of 6.8% grade, white knuckle, coolant killing, awe inspiring magic. Each turn takes you higher into the San Juan Mountains – curves nearly glancing sheer rock to the side. Sneaking a peek backward causes momentary vertigo. For miles you climb. Carved into the mountain, a yawning tunnel invites you into the black and releases you into light 900 feet further on. Wolf Creek ski area sits at the summit, chairs tilted horizontal in the harsh wind, a handful of skiers carving their way down sterling white slopes. Ahead the road crests and begins it’s decent toward Pagosa Springs. It feels like you’ve just reached the highest point on a roller-coaster. Descending Wolf Creek Pass suddenly makes the ascent seem like child’s play. Without constant brake pressure, you would exceed 100 mph in a matter of seconds. This while trying to absorb breathtaking surroundings. It’s a harrowing process of quickly looking left or right, before negotiating the next hairpin turn. Suddenly, the Left Fork of San Juan River spreads out in a snow tinged valley a thousand feet below. An oriental carpet of browns and green texture and design. As I coast into a turnout for a stationary view, the smell of burning brake pads fill the air. I pry my hands off the wheel and walk a short distance to a stunning view. Minutes later I pull into a small turnout for a glimpse of Treasure Falls, dramatically rushing over the face of a volcanic cliff. Below the road flattens along a high mesa leading into Paragosa Springs, home of the world’s deepest geothermal hot spring. To the west lies the Southern Ute Reservation, Durango and entrance to the ‘green table’. This is roughly about the time you wish you had replaced your brakes. Resort in Paragosa Springs, Colorado. Home of the smelliest overlook in America. Imagine it’s the year 1225 AD. Europeans have yet to find North America. A large, highly civilized community is living in the Four Corners region of what one day will be known as Utah, Colorado, Arizona and New Mexico. Skilled artists, diligent farmers, hunters, well defined families. They lived in ‘pit houses’ for over 200 years – holes in the earth, with wood supports that held an adobe roof – before building villages of stone. One day, they began to build elaborate communities into the sides of cliffs, two thousand feet above the Montezuma Valley floor. Beautifully designed structures with balconies, kivas, parapet walls, towers and individual family rooms. Each structure is unique, working within the parameters of what the cliff-side opening provided. The green mesa above and the valley below provided wildlife and fertile soil. Trade from as far away as the Pacific coast thrived, helping to sustain an idyllic setting. Then, within 100 years, the Ancestral Pueblo people walked away from the cliffs, never to return. In 1888, a couple of cowboys were tracking stray cattle in a snowstorm and stopped on the edge of a steep canyon. What they found was later described by novelist Willa Cather. “The falling snowflakes sprinkling the piñons, gave it a special kind of solemnity. It was more like sculpture than anything else…preserved…like a fly in amber.” The cowboys made a makeshift ladder and climbed down to explore the choreographed maze of rooms. Inside they discovered pottery and artifacts, untouched for over 600 years. They called it Cliff Palace. 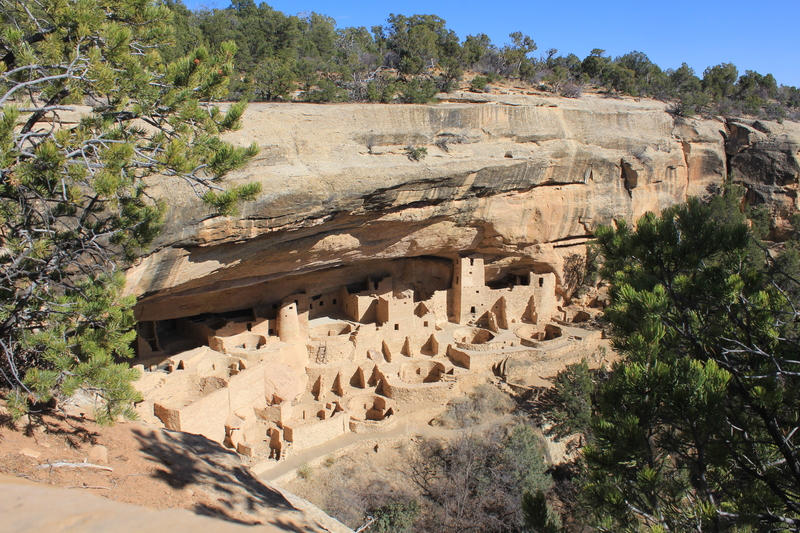 Mesa Verde National Park was created in 1906 to “preserve the archeological heritage of the Ancestral Pueblo people”. It was also created to protect what was referred to in 1905, by the 58th Congress as, “One of the grandest and most extensive views in the country.” As you enter the park and begin to scale the high mesa, Mount Wilson and Lone Cone rise up to the north. The La Plata Range looms in the east, Hogback, Shiprock and Lukachukai Mountains to the south. To the west, Montezuma Valley stretches as far as the eye can see, before ending at the foot of Sleeping Ute Mountain. As the ancient ruins bask in the spotlight of publicity, the lands quietly displays her visual majesty. Various levels of what was once a thriving community. Montezuma Valley stretches out to reach the La Plata Range. The sudden abandonment of Cliff Palace remains a mystery centuries later. Soda Canyon Overlook trail winds along a dry chalky path bordered by gnarled junipers and small scattered rocks. It is a perfect example of a rather non-eventful trail that leads to a breathtaking end. On these types of trails, nothing prepares you for what awaits. Instead they lull you into a false sense of normalcy. A tranquil stroll through the landscape. But to what end is the mystery that draws one to the trail again and again. What’s at the trail’s end? Balcony House from across Soda Canyon. Smaller cliff dwellings in Soda Canyon, seamlessly meld into the rock. Atop the eastern mesa, you enter a large region of burnt trees. Mesa Verde gets the most lightning strikes of anywhere in Colorado. In 2000, almost 40 percent of the 52,000-acre park burned over the course of one week. Since then, multiple fires continue to ravage and what they leave in their wake is ghoulish. Up close the scarred bark has a reptilian sheen. Millions of trees stand naked, blackened by flames, their leafless branches reaching skyward in desperate plea. Many have fallen and rest in contrast alongside grasses and wildflowers given birth by fire. Resourceful Gambel oak regenerates from its own root system and fire may actually stimulate new growth. While thick pinon and juniper forests that once blanketed Wetherill Mesa may take up to 300 years to re-grow. Without my glasses I was certain this sign said NO BIKING BEYOND THIS POINT. So I didn’t. Point Lookout Trail consists of a series of steep switchbacks up the back side of Point Lookout, before running along the top of the mesa. Okay – stop. Before we move on, let’s flesh out a more accurate description of ‘a series of steep switchbacks’. ‘The trail forces you to serpentine up the side of a mountain until your lungs explode.’ That’s one option. ‘When the trail finally leveled out I fell on my face because I had been leaning at a 45 degree angle for so long.’ Or perhaps this sign should be at the trailhead, ‘You may regret the first mile or so of this hike. Have a nice day.’ Mind you, I’m not complaining. It’s just that it sounds so simple when you see it in print. Once above the switchbacks, the trail levels out on a narrow ridge and with the exception of dense, calve high sage, there are no barriers to the edge. If you are afraid of heights, I would recommend concentrating on the scrubby sage and not what lies a foot beyond. Better yet, stay in the middle of the path and repeatedly sing the chorus of ‘Here Comes The Sun’ – the laid back George Harrison/Beatles version, not the Richie Havens version which in fact may lead you directly to the edge in a frenzied state of euphoria. AUTHOR’S NOTE: If you find yourself humming the Coldplay version, step to the edge and lean forward. Point Lookout sits high above the park entrance, with Montezuma and Mancos valley at her feet. The views at 8,427 feet are staggering. My eyes see the colors, the geometric shapes of the valley and my mind flashes to the heavy wool patchwork quilts my grandmother and mother used to sew by hand. I vividly remember the one I slept under as a kid with my three older brothers – Ronald, Kenneth, James – in our green metal bed. The back of the quilt was solid navy. The front, a collection of colors. Blue, brown, burnt yellow. Several patches were patterned in flowers or paisley. All sewn together with red thread looping over the wool, time and time again with no two needle points the same distance apart. An inch or so always dangling at the end of each seam, before being delicately knotted. I remember laying on that itchy quilt as a kid – library books strewn across the bed. Each held wonder – a story, a mystery. Each adventure took me to a new place. I dreamed of cowboys and cannibals. Explorers and lost civilizations. Australia and Africa seemed as if they were distant planets in another solar system. I poured endlessly over maps with blank spaces still to be explored. Maps of the new 50 states, with Alaska and Hawaii as remote as the sun. As I sat at the top of Point Lookout, sawtoothed mountains holding the southern horizon, these memories come rushing back to me and I am thankful for the sense of wonder that hasn’t deserted me. Thankful these places, America’s crown jewels, are still here for all of us to explore. Sarah, recently returned from a weekend in Las Vegas where she essentially lost her life savings. Seen here brooding. Millions of trees destroyed by fire – charred and slick to the touch. Meas Verde has hundreds of lightening strikes per year. Cliffside desert varnish blends with the charred landscape above. Part of a larger structure, tucked into the cliff. Small hand and footholds carved into sandstone were the only means of access. Ancient symbol integrated into the stone structure. The park road steadily climbs to the top of the mesa – winding along the side of grey rock. What’s better than an old neon hotel sign? I can only think of two things. 1. Baseball 2. This is Reginald. He spoke with an English accent, which was at complete odds with his appearance. Next Photos From The Road. Literally.